Is this now what it’s come down to? My correspondents do better than the Leader of the Free World in putting some thought and passion into their reports. Here are a couple of recent examples, I offer as insight, example, and, perhaps, inspiration, to the President who was once an articulate and inspirational speaker and author of distinction and note. “Well for the first time in history this country has labour laws developed by Kosovars for Kosovars. In a somewhat surprising move yesterday, the Assembly passed the labour laws with 46 amendments prior to dissolving the Assembly to begin national elections. Unlike Canada, I cannot yet access the actual provisions adopted [hopefully by week’s end] but I am told that many of the key changes that the BSPK has advocated for were included in the amendments. I am proudest of was getting maternity leave increased from the proposed 3 months to one year with the employer paying the first 6 months, the state the next 3 months and then the option of an unpaid leave for the last 3 months. Big improvement. The other key area was the original draft laws recognized verbal employment contracts as valid in law. I am told that this was also struck down and employment contracts must be in writing. That said there will undoubtedly be some parts of the laws that will be troubling going forward but we will leave that battle for another day. Once I get more info I can provide a fuller update. The other aspect of this that thrills me is that the BSPK [the national labor federation] got a much needed win and they did so by working with civil society for the first time. Both fundamental changes that they desperately needed if they had any hopes of surviving in this new world. If the US President is going to leave the Beltway Bunker and venture out around the world, we all need him to bring his “A” game, not just his B-school buddies, and represent the kind of passion, insight, and sensitivities to culture, context, and history that you can read so easily from Mary and Jeff’s brief notes. This entry was posted in ACORN International, Community Organizations International, International, Labor Organizing and tagged India, jeff fox, mary daley, tanzania by wade. Bookmark the permalink. 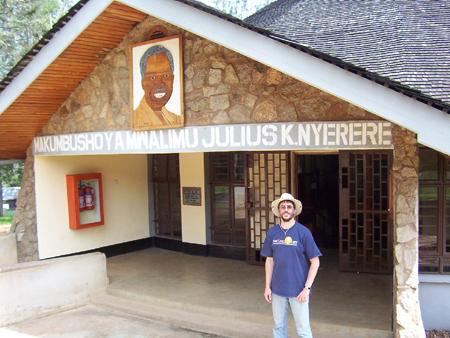 My thanks to you and to Mary Daley for sharing her experiences of her recent visit to Butiama – Madaraka Nyerere.